No se puede conseguir una mejor ubicación !! Situado en el centro del distrito histórico de Mérida, este de dos pisos villa de art deco en el corazón de Mérida colonial, ahora está disponible para alquilar, ya sea a corto plazo o largo plazo. En un barrio tranquilo a sólo cuatro cuadras de la plaza principal, y cerca de restaurantes, la ópera, museos, galerías y tiendas. Esta propiedad dispone de 3 dormitorios, dos baños, una cocina totalmente equipada, cuarto de lavado, sala de estar, comedor, una oficina, un consejo de patio central con una piscina, un jardín privado, una habitación de huéspedes en la planta baja, otra habitación con una terraza de arriba y el dormitorio principal con una gran terraza que da al patio trasero. La villa ha sido completamente restaurado y presenta varias características especiales, como un vestíbulo central que presenta una curvatura abierta esculpido escalera al segundo nivel con una vidriera histórica en la parte superior; un área de descanso en el jardín junto a una fuente de piedra que invita a tiempo para un café o una cena relajada agradable velada, una ducha al aire libre a la sombra de los árboles, y los pisos interiores de baldosas originales hechos a mano. La villa se llena de luz, y todas las habitaciones están abiertas y ventiladas. No hay acceso a internet de alta velocidad. Todas las habitaciones tienen ventiladores de techo y todas las habitaciones tienen aire acondicionado. 2 dormitorios tienen nuevos colchones ortopédicos dobles y el dormitorio principal un colchón de matrimonio ortopédica. lavadora y secadora en el mismo recinto. Barbara, the landlady, is charming and responsive. Ana, the house manager, is efficient and also quite responsive. We only used the kitchen for coffee as there are so very many excellent restaurants in the immediate area, but it was equipped for cooking, if we had wanted to! Perfect location. In the heart of Merida. Ideal location. Great house. I would want to stay here next time I visit. Myself and a group of friends stayed at Casa Flora for several days. The house is great as it provides very accommodating space for non family members. In some regards each bedroom is a suite. The patios provide inviting outside space, both upstairs and at ground level. The interior pool was fun, spending time having a drink and talking. Location was tremendous. We were close enough to al centro to walk as we wished. Merida is a wonderful time. The street Casa Flora is on was quiet and safe. We had the fortune of being there for the New Year and the celebration was excellent. We also used it as a starting point for several side trips, Progresso, Mayapan, Mayan ruins. Also saw (hesitantly) a bull fight. The staff that greeted us was excellent, the house was clean and the kitchen could have provided easy meal preparation, although we did not take advantage of this. All services were wonderful. Barbara, the owner, was prompt in answering any questions we had before making final reservation. We strongly recommend Casa Flora for anyone's visit to Merida. Having rented this house partly on the basis of the effusive reviews, I felt obligated to write this one to provide a different perspective. Three of us rented this house for two weeks. I have rented 5 houses in Mexico and this would rank fourth in quality and fifth in terms of value for money. There are pros: the location is perfect – 4 blocks to the main plaza. Lots of square footage, though not all that effectively used. The beds are comfortable. The appliances work. The plunge pool is a refuge from the heat. The wifi is generally pretty good and the washer and dryer work well. The light controls are pretty advanced and if you like big canvases of warrior princess themed art (I did), you’re in luck. The decorative touches are nice, although calling the place Art Deco is a stretch. The owner is prompt and friendly. And yet…. You’ll notice in the photos that the kitchen is not featured. This is no surprise – the kitchen is awful, by far the worst of the 5 I’ve experienced. It’s decently equipped with a gas stove, a couple of coffee makers, a good blender, and lots of plates. There is almost no work space – if you’re at all serious about cooking it is severely cramped. The pots and pans and the cutlery are worn out and cheap – with normal use we bent more spoons than Uri Geller. There is a decent sized yard and two large terraces off the bedrooms on the second floor, but nothing much has been done to make the spaces appealing – no plants, no furniture on the front terrace, nothing inviting at all. The water feature and outdoor shower are connected to a complicated piping system that leaks when you turn on the tap on upper terrace. We didn’t come here to watch TV but the tiny medieval set – looks like about 14” diagonal – with no cable connection is far below the contemporary standard of a flat screen to which you can attach a computer to show movies. There is no cleaning – not even once a week – which is a unique in my experience (in two rentals there was daily service, which was overkill). The bathrooms are drab and comparatively small. The paint is peeling in several rooms, no mirror in one of the bedrooms, and the general aura is that of a house that is rented but not lived in. There’s no “aha” feel to this house, and it’s certainly not luxury digs. It was a place to crash, not an oasis to enjoy hanging out in. It wouldn't take a lot of money to make the place more appealing. thank you for staying in my house in Merida and happy you enjoyed your vacation. I'm sorry you never reached out to my manager or me while your stay when there was any problems. I'm always here for my tenants to give them advice wehre to go and also to fix things right away if there is any issues. all the issues mentioned were meanwhile fixed. Just finished creating a months worth of unforgettable memories in Casa Flora Merida. A great big thanks to this beautiful home, and the absolutely lovely owner, and property manager. From the start of considering this amazing home, we knew that it was something very special. Our first communication with owner Barbara, was prompt, informative...and a sheer pleasure. The process of reservation was flawless, and swift. Property manager, Ana, was also a pleasure to meet upon arrival. Ana speaks perfect English, and is very kind, and knowledgable. The incredibly beautiful Art Deco style of this home is refreshing, and the building is located in what has to be considered the most ideal location for tourists and locals alike. The building construction creates a cool interior temperature, although all rooms have air conditioning, and fans for your comfort. The kitchen is well accessorized, and equipped for all levels of cooking. My husband and our 2 kids stayed at Casa Flora for 2 weeks and had an amazing time in Merida. It was our first time here and the house was just perfectly located in the middle of the historical center, walking to everywhere from the house. The Main Plaza ist just a couple of minutes away. Every Sunday there is a nice big farmers market with yummy Mexican food and all sorts of hand crafted souvenirs to buy. We have seen a lot of great places like Chichen Tza , the beach along Progresso, the flamingos and many others beside swimming in those amazing Cenotes. The house itself, Casa Flora, is super beautiful. A mix of Art Deco and Colonial Style. 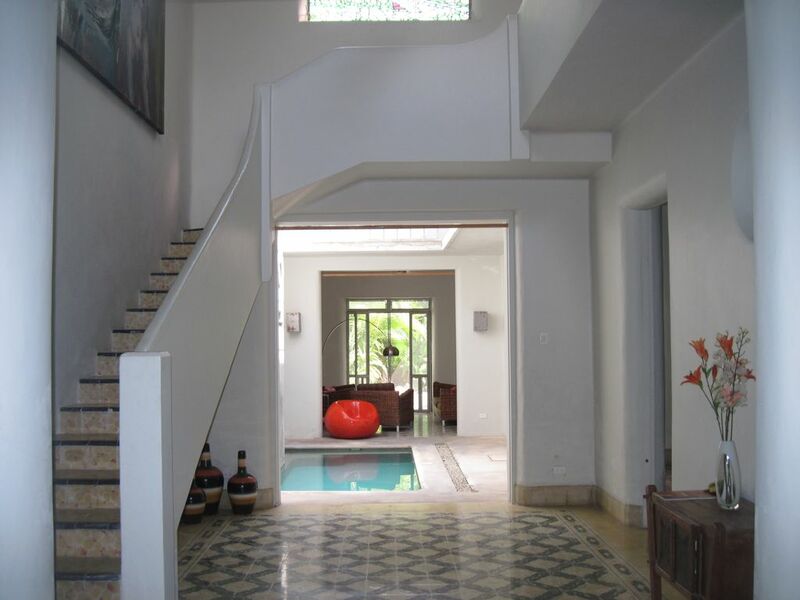 Very modern but still with old charming features like those old handcrafted tiles that go through the whole house. We showered under the outdoor shower under a huge palm tree - what a treat!!! Really a perfect sanctuary and the sound of the water fountain running added to the oasis-feel. The owner and manager were both extremely supportive and we would come back any time in the future for another stay at Casa Flora. Booking was very easy by the way. We highly recommend this rental to everyone.